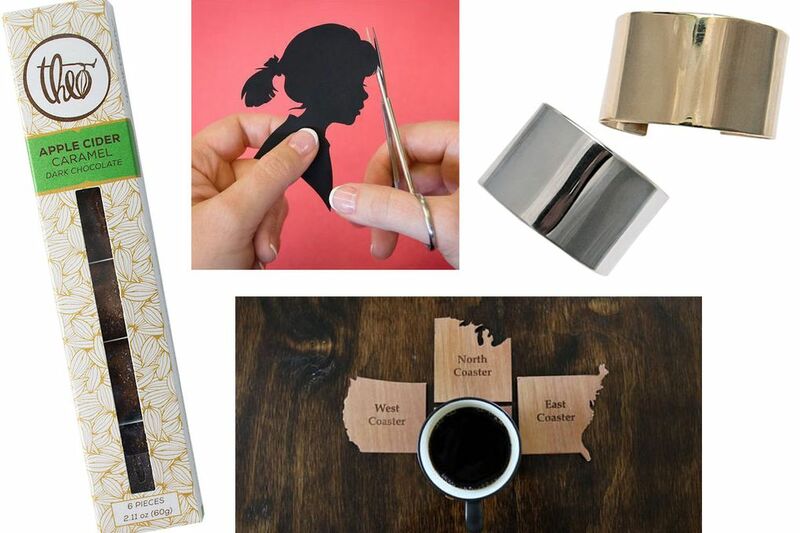 Great Christmas gift ideas at every price point, from $20 and under to downright splurges. It’s officially the time of year when the pressure to check every name off your list is only topped by the pressure to stay within your budget. But have no fear. 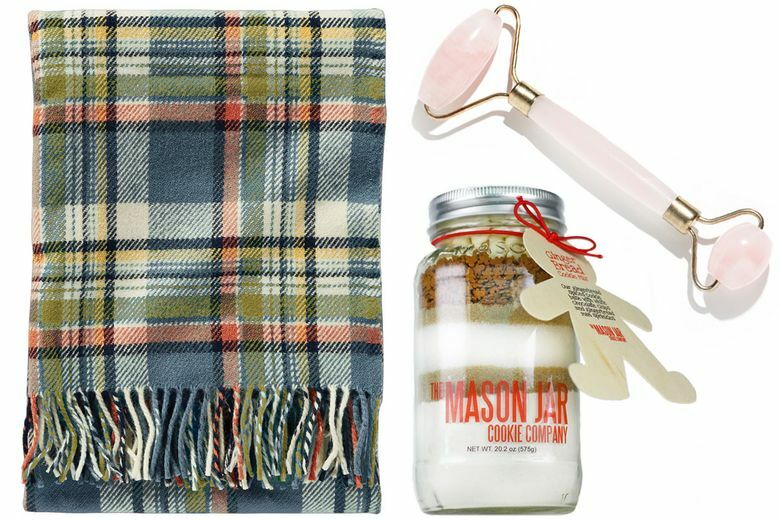 There are great gifts at every price point, from sweet treats and stylish accessories to fresh gadgets and sleek skis. Here are some ideas to get you started (and to circle and slide in front of loved ones). Theo Dark Chocolate Apple Cider Caramels ($10 at the Theo Factory Store, Fremont, and theochocolate.com). Switch from the usual sea-salt caramel to this variety made with tangy-sweet apple cider, dark chocolate and warming spices. 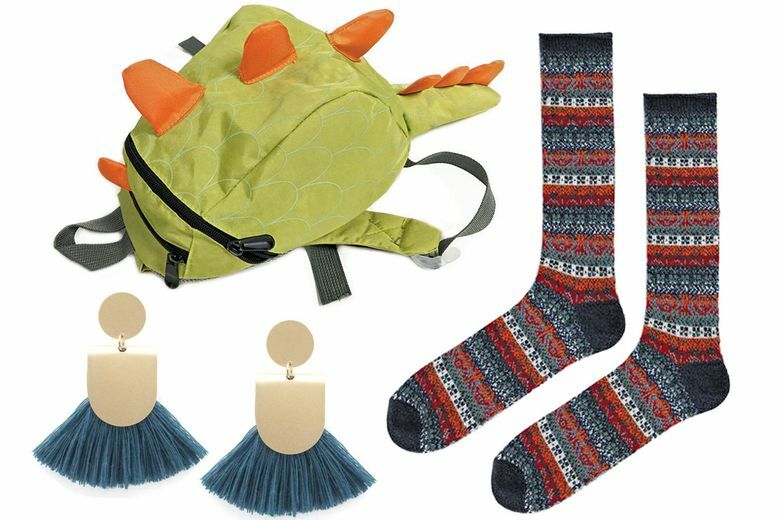 Bowbear Preschool Dinosaur Backpack ($14 at amazon.com). Your preschooler will feel dino-mite toting this cute carryall that fits their favorite toys and books and has padded straps for comfort. Anonymousism Fair Isle Gradation Crew Socks ($25 at Freeman, Capitol Hill, and freemanseattle.com). His feet will stay warm and cozy in these seasonal Fair Isle-patterned socks handcrafted in Japan on vintage sewing machines. The Mason Jar Cookie Company Gingerbread Cookie Mix ($14 at masonjarcookiecompany.com). Coworkers and party hosts will enjoy this smartly packaged gift that’s easy enough for the novice baker and delicious enough for the old pro. Heart of Timber Coastline Coasters ($29 for four at etsy.com/shop/HeartOfTimber). This laser-engraved wood coaster set out of Boise will be a party pleaser no matter where you travel over the holidays. Pick up a set of four featuring the West Coast, one of each coast or a custom combo. Hearth & Hand with Magnolia Plaid Pet Bed ($35 at Target). Don’t forget Fido. This plush bed is the perfect gift for your cuddly companion and his design-conscious owners. Herbivore Rose Quartz Facial Roller ($45 at herbivorebotanicals.com). Help a perpetually stressed-out friend ease tension and improve her circulation with this new, locally made, two-sided rose-quartz lymphatic massager that eliminates toxins, reduces puffiness and evens out skin tone. Baleen Pinna Earrings ($48 at Baleen, Ballard, and shopbaleen.com). These stunning, made-in-Seattle statement earrings will please the most fashion-forward woman on your list. Kerry Cook Hand-Cut Silhouette (starting at $30 at Bootyland Kids, Wallingford). Book an appointment with local silhouette artist Kerry Cook on Dec. 10 for an original, hand-cut portrait of your little one. Cook is one of a tiny handful of artists who create true silhouette likenesses, rather than relying on formulas or caricatures. The heirloom gift is guaranteed to elicit more than a few tears. Pendleton Eco-Wise Wool Throw with Carrier ($119 at pendleton-usa.com). There’s no such thing as too many blankets, especially when they’re made by Pendleton from renewable wool and vegetable dyes to reduce impact on the Earth. They’re also machine-washable and come with a leather carrier with handle and shoulder strap. Sophie Velvet Kimono ($88 at Anthropologie). She can wear this chic piece to the office, as a holiday-party topper and into next spring’s wedding season with a simple change of accessories. See Kai Run Abby Waterproof Boot ($70 at seekairun.com). Warm and waterproof, this new, locally designed children’s boot is thermal-lined with a faux shearling cuff, and has a durable nonslip sole and wide opening to help them do it themselves. 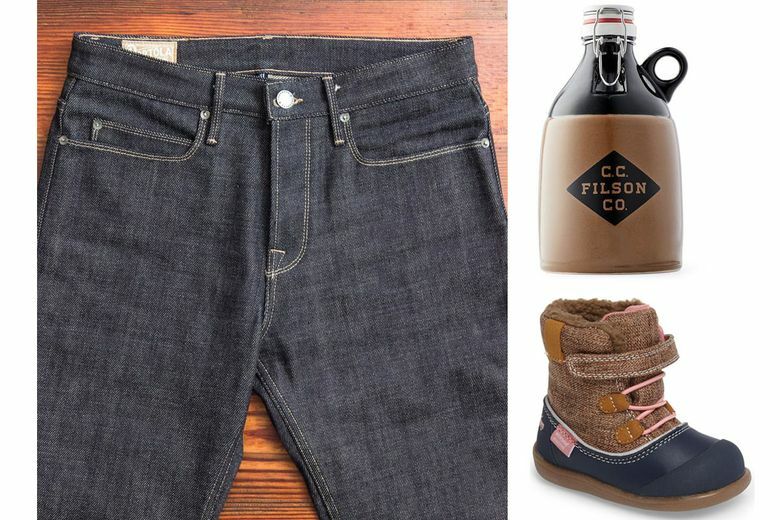 Filson Growler ($100 at Filson, Sodo and Ballard). This limited-edition ceramic growler, designed and hand-cast by Portland Growler Co., celebrates the local heritage brand and our craft-brew dominance with rustic style. Amazon Echo 2nd Generation ($120 at amazon.com). The Alexa train keeps rolling. 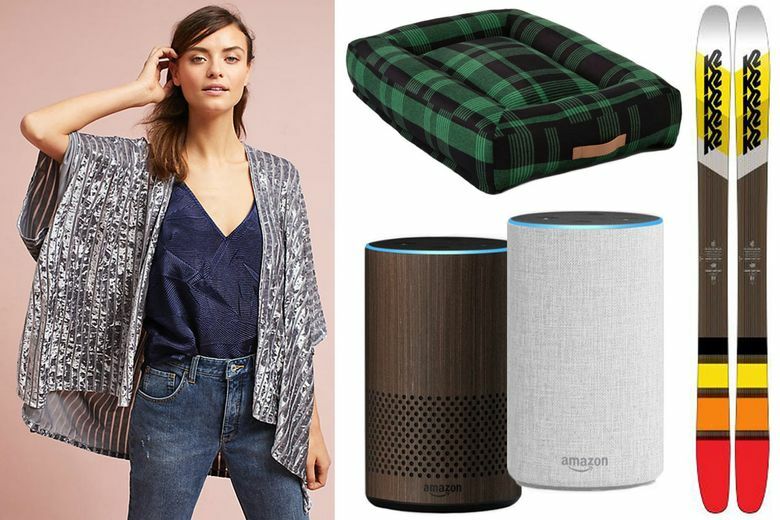 If they’re ready to hop on, this upgraded device will bring the voice-activated assistant into their home with an improved speaker, new microphone technology to better pick up voice commands, and six new fabric and wood-veneer shells. Lizzie Fortunato African Sky Collar ($345) or Crystal Dagger Earrings ($220, both at Supply Chain, West Seattle). Dainty is nice, but these pieces make a statement. The gorgeous, hand-beaded crystal collar has a black grosgrain ribbon tie, while the earrings feature hand-embroidered glass stones on a fabric back with onyx tops. Freenote Portola 19oz Selvedge Denim ($290 at Blue Owl Workshop, Fremont, and blueowl.us) Made in the U.S. from 100 percent selvedge raw denim from Japan, these jeans will last a lifetime and pair with anything. Faris Bold Cuff ($220–$335 at Rizom, Belltown, and farisfaris.com). Made in Seattle, this minimalist but dramatic cuff can be had in bronze or sterling silver for a luxe gift she’ll wear year after year. K2 Marksman Skis ($600 at REI). The snow is falling and they’re ready to hit the powder. Thrill them with these locally designed all-terrain skis with a twin rocker profile that creates a smooth ride in all types of conditions.